The 146,500 square-foot Wegmans Food Markets at Natick Plaza is set to open its doors Sunday, April 29. It’s the sixth Wegmans to open up in Massachusetts, following locations in Burlington, Westwood, Chestnut Hill, Medford and Northborough. 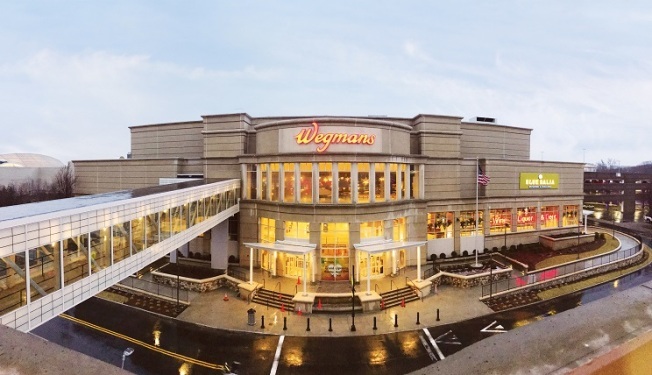 The first Wegmans opened in the Bay State in 2011. Wegmans, founded in 1916 in Rochester, New York, remains family owned and operated. The Wegmans in Natick comes equipped with a pair of full-service restaurants: Blue Dalia, a Mexican restaurant and tequila bar, and The Burger Bar, a casual restaurant that is also open at the store in Medford. Blue Dalia, which will open on May 4, is inspired by Culinary Director Roberto Santibañez and his hometown of Mexico City. The name is a nod to the national flower of Mexico, the Dahlia. "Guests will see centuries-old-tortilla making on display alongside crushed-to-order salsas, contemporary craft cocktails and of course, extensive tequila and mezcal selection," Santibañez said in a press release. "Being inside the market, we have immediate access to the best seasonal produce and ingredients. As a chef, it’s really a unique and exciting place to offer this restaurant." Chef Geno Bahena will lead the day-to-day operations in the kitchen at Blue Dalia.